It has been some time since we have looked at stock market valuations and expected future returns. I made a large point in Bull’s Eye Investing that long term returns are closely correlated with the valuation of the stock market upon entry. In fact, I argue that secular bull and bear markets should be viewed in terms of valuation and not prices. The market clearly goes from high valuations to low and back to high again over very long periods of time. The average length of a secular bull or bear cycle is 17 years. This week’s Outside the Box from my friend Prieur du Plessis of Plexus Asset Managment looks at what long term return expectations might be from today’s stock market valuations. He offers us a range of expectations which I think should help you in your investment decision making process. I am on my way back to Dallas from a quick trip to Washington DC. The cherry blossoms are beautiful, even if the weather is grey. Are we perhaps nearing the end of a cyclical bull phase in a structural bull market? Or will strong earnings growth ensure the longevity of the bull? Or is a “muddle-through” trading range in store? It seems to be a case of so many pundits, so many views. 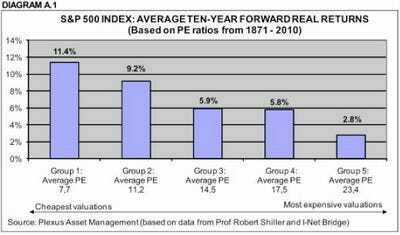 In an attempt to cast light on this issue, my colleagues at Plexus Asset Management have updated a previous multi-year comparison of the price-earnings (PE) ratios of the S&P 500 Index (as a measure of stock valuations) and the forward real returns (considering total returns, i.e. capital movements plus dividends). The study covered the period from 1871 to March 2010 and used the S&P 500 (and its predecessors prior to 1957). In essence, PEs based on rolling average 10-year earnings were calculated and used together with 10-year forward real returns. In the first analysis the PEs and the corresponding 10-year forward real returns were grouped in five quintiles (i.e. 20% intervals) (Diagram A.1). 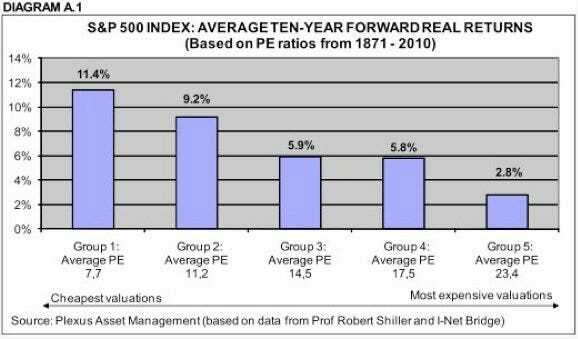 The cheapest quintile had an average PE of 7.7 with an average 10-year forward real return of 11.4% per annum, whereas the most expensive quintile had an average PE of 23.4 with an average 10-year forward real return of only 3.8% per annum. This analysis strongly confirms the downward trend of the average 10-year forward real returns from the cheapest grouping (PEs of less than six) to the most expensive grouping (PEs of more than 21). The second study also shows that any investment at PEs of less than 12 always had positive 10-year real returns, while investments at PE ratios of 12 and higher experienced negative real returns at some stage. A third observation from this analysis is that the 10-year forward real returns of investments made at PEs between 12 and 17 had the biggest spread between minimum and maximum returns and were therefore more volatile and less predictable. As a further refinement, holding periods of one, three, five and 20 years were also analysed. The research results (not reported in this article) for the one-year period showed a poor relationship with expected returns, but the findings for all the other periods were consistent with the findings for the 10-year periods. Based on the above research findings, with the S&P 500 Index’s current 10-year normalized PE of 20.3 and 10-year normalized dividend yield of 2.1%, investors should be aware of the fact that the market is by historical standards expensive. As far as the market in general is concerned, this argues for unexciting long-term returns, possibly a “muddle-through” trading range for quite a number of years to come. Although the research results offer no guidance as to calling market tops and bottoms, they do indicate that it would not be consistent with the findings to bank on above-average returns based on the current 10-year normalized valuation levels. As a matter of fact, there is a distinct possibility of some negative returns off current price levels.